Bubby Makes Three: Exciting News - An addition to our family! Exciting News - An addition to our family! Are you serious? No way! 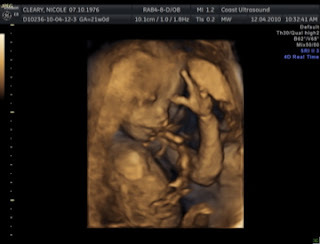 That image is little Elliott in utero at about 20wks and a picture is about as close to a new baby as I wanna get at the mo! The cute thing is that now I can look at it and see a definite resemblance to the little boy he is today! Dan decided to drop me off at the gym one afternoon and get some sushi with the kids, then pick me back up afterward. When I walked out an hour later, I was greeted by my family -- all beaming from ear to ear. I was immediately suspicious. Fern was clutching onto a plastic bag filled with water and held it up for me to see like it was a pot of gold... and it was gold... of sorts. Yes, a goldfish had been chosen to come home with us. It already had a name. I was a teeny bit cross, I'll admit. I kinda thought anything that breathed should be signed off by ALL adult members before being brought into our home... I have enough to do with two little kids and a stinky-rador and saw myself being the one scrubbing mouldy fish tanks and remembering to feed and change its water... but I realised it could have been worse. It could have been a rabbit. Or -- horror and shudder -- a mouse. So, Sally came home and was deposited into her new plastic tank along with some rocks and some tedpid tap water (geez Dan, you coulda at least bought a nice glass bowl!). Fern and Elliott stood at the little table and peered in at her. She peered back. And Sally was thus inducted into the family. So now we have a goldfish. Have a lovely loooong weekend, fellow Aussies! Congratulations on the new arrival / bundle of joy! At least it shouldn't keep you up at night. oh my word- i almost died! You gave me a heart attack for a second there :) Thought you were serious about bub #3!! Bet Fern loves her new fishy friend. I'd be slightly peeved if I weren't consulted about pets too but as you said, at least it wasn't some furry critter. Jesus Nicole, you made my say 'What!!' out loud!!! You totally got me...! Congrats on the new addition. Hopefully easier than a new babe though quite possibly harder to keep alive. They have a habit of stomach floating those little goldies! I did a double take as well . . cheeky miss! :) Enjoy your long weekend!! This almost gave me a heart attack!! Welcome to the family Sally.